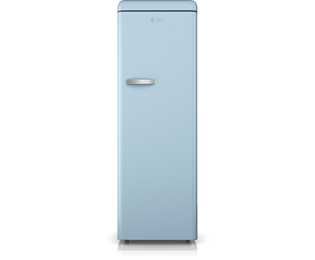 Add some real retro style to your kitchen with this blue larder fridge from Swan. It has a generous 330 litre capacity, which means it has room for 18 bags of food shopping inside. This model has an efficient A+ energy rating and an annual energy cost of £22.02, so you’ll find it’s kinder on your wallet as well. It’s also a great choice if you like to relax with a glass of white or rose, because there’s a handy wine rack inside that’s perfect for keeping your favourite bottles secure. A very attractive fridge - it’s like a piece of art in its own right! Great capacity with moveable shelves including door shelves which are a bonus. Handle doesn’t seem as sturdy but is very much a feature of the look of the fridge. The blue is really nice and works well in my kitchen - really pleased I bought it rather than an ordinary looking fridge. The appliance brightens my kitchen. It keeps food at a cool temperature and has loads of storage space. Just wish Swan would have explained in its booklet whether to remove or leave the little plastic bit in the inside drain hole at the base of the shelves but a call to the Swan service centre answered my question.